Recipe is Here at Smitten Kitchen’s site. So I don’t have to retype it all out, I basically followed Smitten Kitchen’s recipe verbatim. Or would you rather I type out the recipes here? Anyway, I am waiting to take the homemade granola out of the oven and I don’t want it to burn, so this will be short and sweet. The two oddball cookies on the dish in the photos are what’s left of my previous cookie batch, molasses spice cookies. I only had one or two of those. They are by special request of the King of the House (no, not Kip — Paul!). Oh, and these biscotti are so good! You make the dough, shape it into two logs and bake, then let cool for 30 minutes, then slice and then bake again, turning once. They are supposed to be “crunchy” and not soft. However, mine turned out a tiny bit too hard for my liking. I did find the solution quite by accident, though. Dipping it in a hot cup of coffee was sublime. Oh, there goes my timer for the granola. This is all she wrote folks. Do try these. They are heavenly. And for future reference, check out this page of biscotti recipes galore. Well, my biscotti are certainly hard enough to dip into coffee and retain their shape, and that is the perfect way to eat these. What flavour! I’m afraid I don’t have alcohol in my house, so I didn’t use the orange liqueur called for in the recipe. I used orange extract instead, as well as the orange zest, and there is a nice orangey flavor to these as well. I think I’ll go down now and get my cuppa going and have one! 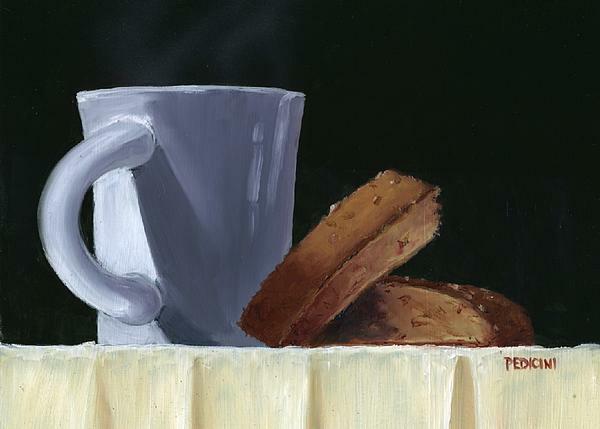 Biscotti are suppose to be hard enough to dunk into coffee and hold their shape to eat. They are used as breakfast cookies in Italy. You can skip the second baking if you want a softer cookie. No Harriet, but I will google it now. Interesting. I love almond flavor. I do have almond flour but never thought to use it in this! Found a good mandelbrot recipe here. Thanks. I am learning so much about cooking lately. Have you ever tasted mandelbrot? (It translates to almond bread.) The recipes seem quite similar.